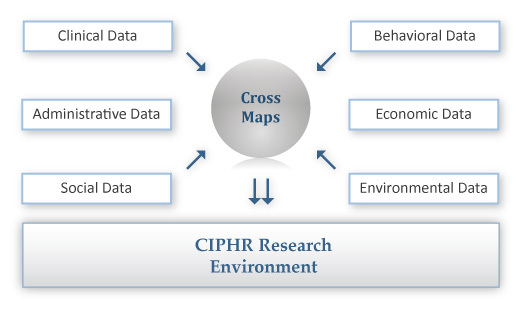 CIPHR provides the informatics foundation for optimizing cancer outcomes in North Carolina and beyond by linking and accessing multiple population, clinical, and other data sources. Researchers interested in using any of the CIPHR data resources in their studies should complete and submit our Proposal Form. Upon receipt, CIPHR operations staff will review the form and contact the researcher for further discussion. The CIPHR dataset is growing linked resource that includes cancer case data from the North Carolina Central Cancer Registry linked to administrative and claims data for North Carolinians from Medicare, Medicaid, and private insurance plans. Linked, this data resource covers approximately 80% of the North Carolina cancer population and approximately 55% of the total North Carolina population (cancer and non-cancer). Incorporation of additional population, clinical, and other data sources into the linked CIPHR dataset is ongoing. These aggregated datasets are available through the CIPHR Portal. Interested researchers should request an account on the portal to access the data. The CIPHR team has a variety of other data resources available, including North Carolina driving distance data and road network/density mapping, and synonomy mapping. The CIPHR research team encompasses a talented group of multi-disciplinary researchers who apply rigorous and novel scientific methods. Our expertise encompasses advanced probabilistic data linking, person-level statistical analysis as well as aggregated or geospatial units of analysis. We have expertise in epidemiology, biostatistics, econometrics, and geospatial analysis. Our methods group focuses on applying rigorous scientific techniques starting at the study design phase, to analytic data creation, through statistical analysis. The research group frequently uses advanced techniques for longitudinal data analysis including multilevel models and bias reduction methods such as propensity score weighting and instrumental variables. If you are interested in using CIPHR data for research purposes, please complete and submit our Proposal Form. Upon receipt, CIPHR operations staff will review the form and contact the researcher for further discussion. We will assist with proposal development as it pertains to the use of CIPHR as well as IRB documents. If you agree to use CIPHR, we will review your proposal with our governance committee and seek their approval before final access to data is granted.